Warm weather is almost here! 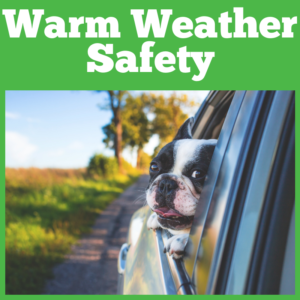 As the temperature begins to climb, it becomes critical that we remain vigilant to the hazards that warm weather poses to our pets and their health. According to PETA, last year 56 companion animals were killed by heat-related causes. With a few tips, we hope that we can help pet owners decrease this number, and keep their animals looking and feeling cool this year. 1. Be able to recognize the signs of heat exhaustion. These are all signs that your animal is suffering from a heat stroke and that you should take action immediately. 2. Learn the most effective ways to cool an over-heated animal. Use cool (not cold) water to decline the animal’s body temperature while ensuring that it is in a shady, well-ventilated area. Take the animal’s temperature and seek a veterinarian’s advice as soon as possible. Offer small amounts of water but never force the cat to drink. Place the cat in a shady, cool area with lots of ventilation on top of a wet towel. 3. Be able to recognize the signs of heat exhaustion. Preventing heatstroke means that you provide your animal with a constant source of water, in addition to a cool, ventilated area for them to escape the heat of the sun.